A record-breaking number of visitors have taken part in the UK’s biggest-ever showcase of the trillion dollar Muslim consumer market. Over 12,000 people from across the country attended the 2nd annual Muslim Lifestyle Expo 2016 (MLE2016) which took place at EventCity in Manchester. Alongside a modest fashion show, comedy acts, and a live cooking theatre, the two-day event saw over 130 exhibitors from 20 countries including brands such as Asda, Turkish Airlines and Brunei Halal promote their products and services. Over six in 10 exhibitors taking part were Muslim female entrepreneurs from across the country. Tahir Mirza, founder of MLE, said: “Our vision has always been to create a commercial platform that highlights the growing Muslim lifestyle sectors and we are delighted to have delivered this again through MLE2016. “The expo serves to highlight the immense contribution the Muslim community makes to the global economy. “It is our third MLE event in the space of 14 months which is now the biggest showcase of the rapidly expanding global Muslim lifestyle sector and is becoming a firm fixture in the calendar. “MLE is a great platform for entrepreneurs and start-ups and it gives them the confidence to flourish. The high number of Muslim businesswomen is a great example of this highlighted by our packed ‘mumpreneurs’ panel discussion. The Muslim consumer market is now one of the biggest in the world growing at nearly double the rate of the global economy. According to a report by Thomson Reuters, the Muslim consumer spending on food and lifestyle products and services has been estimated at $1.8 trillion in 2014 and projected to reach $2.6 trillion in 2020. 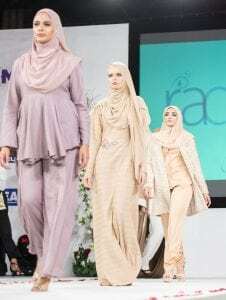 Highlights from this year’s Muslim Lifestyle Expo, included six fashion shows from leading modest fashion brands, a dedicated health zone, an Islamic art gallery, a live food demo theatre featuring Great British Bake Off’s Ali Imdad, comedy by British Muslim comedians like Aatif Nawaz and BBC Three’s Guzzy Bear. Exhibitors included Turkish Airlines, ASDA, Al Rayan Bank, RAF, Lancashire County Cricket Club, Haloodies, Manchester Art Galleries, Abaci, Modestly Active and Human Appeal. Exhibitors came from around 20 countries including USA, Qatar, Australia, Malaysia, Indonesia, India, Russia, Turkey, France, Austria, Germany and UAE. Products on display ranged from mocktails, greeting cards, luxury prayer mats, Islamic toys, food, fashion, accessories and cosmetics. Thought leaders like CEO of Alchemiya Navid Akhtar, Abdalhamid Evans, founder of HalalFocus, FTSE 100 mentor Moe Nawaz and established entrepreneurs highlighted the growth of the Muslim lifestyle markets by sharing business insights and advice at the MLE Connect seminars during the two days of the expo. The Muslim Lifestyle Expo has been created to provide a unique marketing platform for global brands and businesses to engage with the Muslim consumer. Earlier this year, Muslim Lifestyle Expo won the Services in Creativity and Technology award at The British Muslim Awards 2016.